Two terrestrial planets orbiting a mature sun-like star some 300 light-years from Earth recently suffered a violent collision, astronomers at UCLA, Tennessee State University and the California Institute of Technology will report in a December issue of the Astrophysical Journal, the premier journal of astronomy and astrophysics. "If any life was present on either planet, the massive collision would have wiped out everything in a matter of minutes � the ultimate extinction event," said co-author Gregory Henry, an astronomer at Tennessee State University (TSU). "A massive disk of infrared-emitting dust circling the star provides silent testimony to this sad fate." Those expectations were shown to be premature, however, when Carnegie Institution of Washington astronomer Alycia Weinberger announced in the May 20, 2008, issue of the Astrophysical Journal that BD+20 307 is actually a close binary star � two stars orbiting around their common center of mass. "There is no question, however," Zuckerman said, "that major collisions have occurred in our solar system's past. 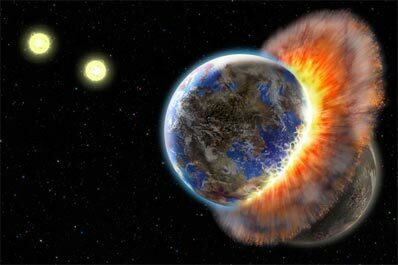 Many astronomers believe our moon was formed from the grazing collision of two planetary embryos � the young Earth and a body about the size of Mars � a crash that created tremendous debris, some of which condensed to form the moon and some of which went into orbit around the young sun. By contrast with the massive crash in the BD+20 307 system, the collision of an asteroid with Earth 65 million years ago, the most favored explanation for the final demise of the dinosaurs, was a mere pipsqueak."